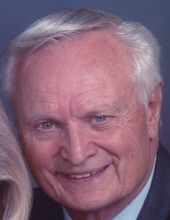 Richard “Rich” Kostin, a long time resident of Milford, former resident of Dearborn, and retired mechanical engineer from Ford Motor Company, died at home in the care of family on September 3, 2018 after a battle with liver and lung cancer. He was 81 years old. Richard Kostin was welcomed into this world by John and Constance Kostin on November 18, 1936. He grew up in Dearborn, Michigan where he attended Fordson High School and made lifelong friends. Richard was both athletic and studious. He enjoyed a variety of sports and played on the high school football team. At the age of 16 he became part of the Civil Air Patrol, an achievement he valued highly. Richard was accepted into General Motors Institute where he earned his Bachelor’s degree as a Mechanical Engineer. He rarely took a break from his studies while there, but made an exception to take his sweetheart, Pat, to her Senior prom. The story goes if Richard was not able to make the prom, Pat’s girlfriends were going to find her another date, and there was no way he was going to allow that! Richard worked for General Motors after graduation, and then accepted a position at Ford Motor Company. He retired from Ford Motor Company in 1996 after 35 years of loyal service. Richard married the love of his life, Patricia (Pat) Pilzner on November 29, 1958. As a husband, Richard lived by the motto, “Happy Wife, Happy Life.” Pat was always his top priority. He took pride in his ability to provide for her, and tackle a variety of home maintenance and improvement projects. Richard and Pat both became avid golfers which afforded them many enjoyable times with good friends and each other throughout their 60 years together. It wasn’t long before the pitter pat of little feet started when Susan was born in 1960, and Kurt, Beth, and Greg followed. They say if you follow where a man spends his time and money you will find his true heart. For Richard, this was clearly with his family. Richard coached or managed various hockey teams in Dearborn his sons, Kurt and Greg, played on, and was also able to share in the lives of his high school friends Bob Hyde and Jack Ewing with this activity. Richard loved to fish, and took many fishing trips with his friends and sons over the years. He also made sure to attend his daughters’ dance recitals and community theater productions. It was important to Richard to support his children in their activities to let his children know they were important to him and that he took pride in their achievements. Richard instilled in his family the values of hard work and a good education. Richard encouraged his children to study hard and pursue advanced degrees. He wanted them to be able to have all of the opportunities in life to pursue careers they enjoyed. Richard was also very involved in the lives of his grandchildren. He actively supported their various interests and was often in the audience cheering them on. Richard taught Shawn and Derek how to golf, and enjoyed many outings with them even caddying for them at high school tournaments. He watched Sierre’s equestrian competitions and traveled to Interlochen one summer to see her artwork on display. Richard attended various karate exhibitions for Kelman, and was there when he achieved his black belt. He enjoyed picking Kaia up from figure skating practice, and cherished the alone time they had together in the car where he heard all of the latest details of her life. Richard believed in volunteering and giving back to the local community, and he continued this through his retirement years. He was an active member of St Mary’s in Milford where he regularly ushered and organized the annual summer fair. Richard served on the Milford Village council, and participated in activities at the Milford Senior center. Richard was the best husband and father one could ask for. He was mostly loved for his unconditional love. He was always there for the good times and the bad with open arms. We always knew we had his love and support no matter what. He will be greatly missed by his family and all who knew him. He is survived by Patricia, his beloved wife of sixty years; his daughters, Susan (Jerry) Simancas and Beth (Gary) Senak; his sons, Kurt (Lindsey) Kostin and Greg (Teri Wolf-Kostin) Kostin; grandchildren, Shawn and Derek Simancas, Sierre, Kelman and Kaia Wolf-Kostin; brothers, John (Marilyn) and William (Donna) Kostin; sister, Joan (John) Kiefer, and many extended family members and dear friends. He was preceded in death by a brother, Alan Kostin. Visitation will be held at Lynch & Sons Funeral Home, 404 E. Liberty Street, Milford, on Thursday, September 6, from 3-8PM with a Time of Sharing at 7PM. Mass of the Resurrection will be celebrated at St. Mary Our Lady of the Snows Catholic Church, 1955 E. Commerce Rd., Milford, on Friday, September 7, at 3:30PM. Friends may gather at the church from 2:30PM until the time of Mass. Cremation will follow. Memorials may be made in his name to Great Lakes Caring Hospice or to the American Cancer Society. For further information please phone 248-684-6645. Hour of gathering prior to the service. "Email Address" would like to share the life celebration of Richard Michael Kostin. Click on the "link" to go to share a favorite memory or leave a condolence message for the family.